We really enjoyed staying here, great place for everyone. The owner Gerald was super nice and was able to help with all our questions, diffenlty will.come again! Thank you for taking the time to write a review. I enjoyed having you as our guests and meeting some of your family members. I was glad to see that you were able to rent a golf cart to get around the resort and island. We look forward to your next visit. Take care. We spent the Thanksgiving holidays at Mr. Oakley's property and found it offered everything described and then some! We loved the idea of two kitchens--probably more well-appointed than any place we've ever stayed. The rooms were spacious and the beds very comfortable. We enjoyed watching the golfers from the porch and the location close enough for a short drive to the beach. Although we worked hard to prepare our turkey dinner with everyone's favorite sides we had plenty of room and all went smoothly. Our daughter's family brought their little dog, and she just settled right in with us. This was a wonderful reunion for all of us, thanks to the attention from Mr. Oakley as he answered our questions along the way. This was our first experience with vrbo and it couldn't have been more positive. We highly recommend this property and will look forward to our next visit! Thank you for staying with us over Thanksgiving. You were a pleasure to work with. Thanks for leaving our place in great shape and reporting a couple of items that needed attention. I hope you will return in 2017 and beyond. Take care. We loved the spacious feel of the Villa! Quiet, comfortable and luxurious! Great location for families! Thank you for the wonderful time! Thank you for staying with us and taking the time to write your review. I am glad you enjoyed your stay and I hope you will return again. Based on your comments and your husband's while you were here, I expect you will return many times. Take care and thanks again. We loved our stay it was like being at a home away from home. The condo was very inviting and kid friendly and everything was nice and comfortable. First rate rental property with lots of space. 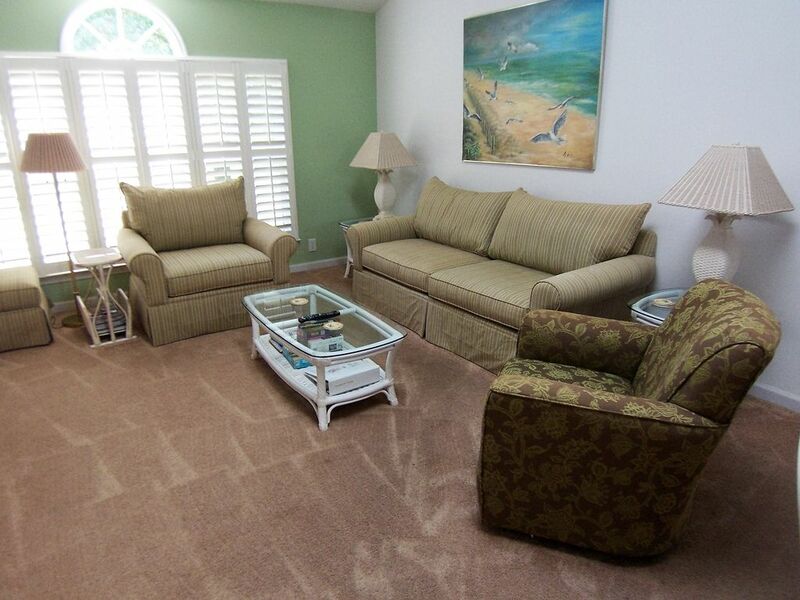 Overall, great location and convenient to Sunset Beach and Calabash area and many golf courses. Plenty of room to comfortably accommodate 3 couples or a couple of families with privacy. Only real disappointment was no access to water outside the residence to wash off sand from the beach; the outside faucet was padlocked. When going to the beach every day, getting cleaned up to avoid tracking sand into the residence was frustrating. The Owner should look into this. Thank you for your review. The outside spigot is for our guests to use. Wish you had called me and I would have removed the lock. I live at Sea Trail and would have been happy to remove it for you. We lock the spigots throughout the year, except the peak season, because landscaping companies sometimes fill their tanks from our water. This gets very expensive because the sewer charge is based on our water usage. It was an oversight on my part not to have removed it. Sorry for the inconvenience. Thank you for leaving our property in such great shape. It is much appreciated. I guess we would have had a 5 star rating if I had not forgotten..... Thanks for staying with us and I hope you will return. Great place. Easy and organized! Close to beach. Would stay again for sure. Thank you! Thank you very much for the nice review. It is most appreciated. I am glad you and your family enjoyed your stay and we hope you will return again in the near future. Thanks again.